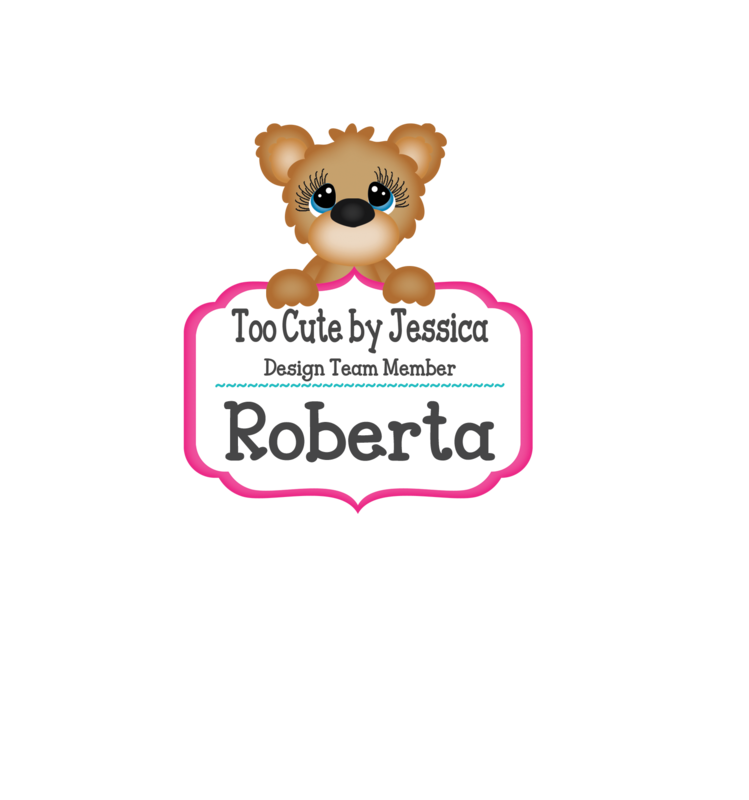 Hi Everyone, I’d like to announce that I am very happy to be a new member of the Too Cute By Jessica Design Team. YAY! Like to share a card that I made for St. Patrick’s Day. To outline various parts on the characters, I used various colours of chalk. Eyelashes were done with Pigma Micron 03 Archival Ink Pen. Eye highlights with Gelly Roll Sakura #8 Pen. Grass – Shamrocks from – Cricut Cartridge – A Child’s Year. “St. Patrick’s #M2F10F”. 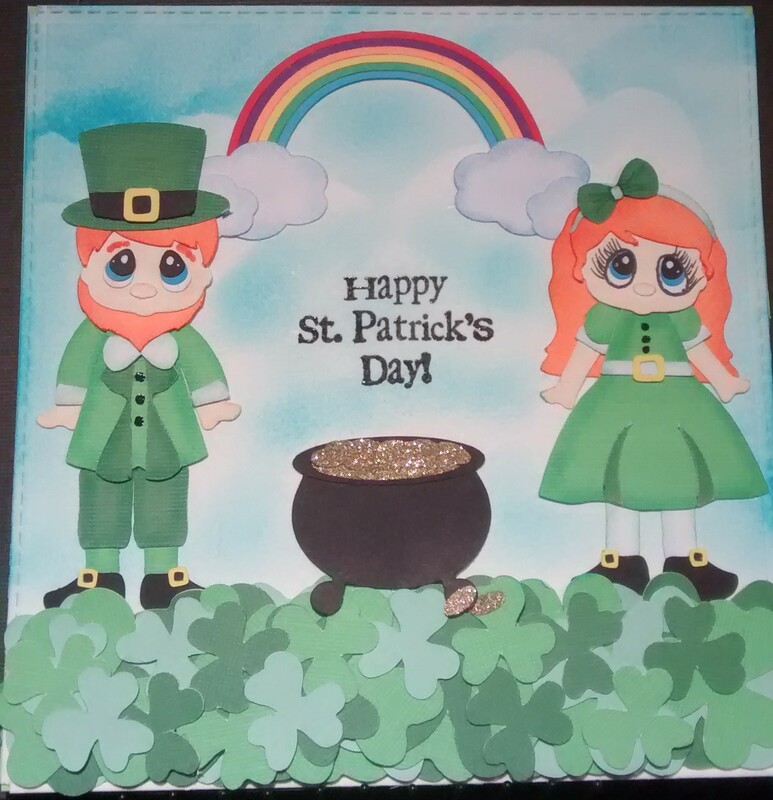 I inserted the image into Cricut Design Space and then ungrouped the image and deleted all parts except for the Shamrock. I then did a copy and paste twice. Making the shamrock into various sizes. Next, I copied and pasted all 3 images twice more. 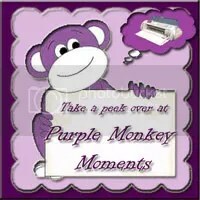 Then printed out to the Cricut Explore telling it to print the image 8 times. Used my Xyron Creative Station and Xyron Create a Sticker to for all of the pieces to make it easier to put everything together. 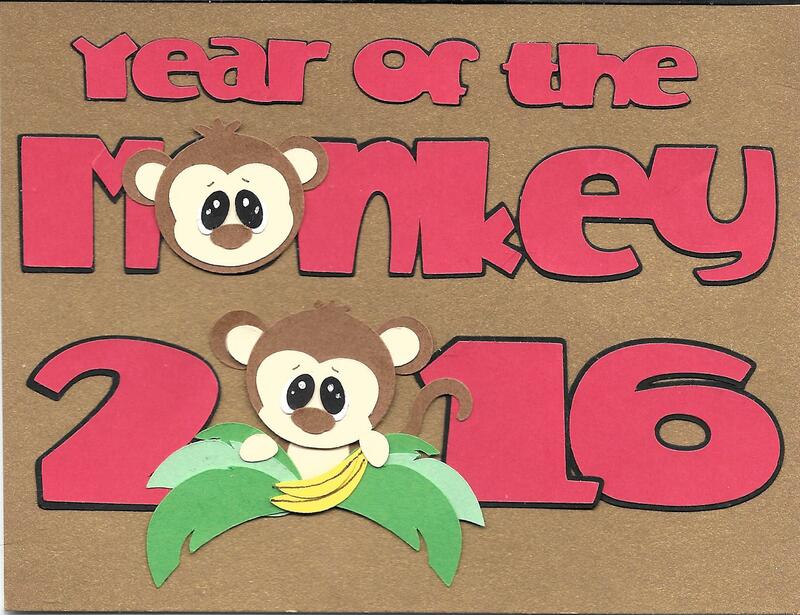 Back to share my cards for Chinese New Year 2016. I know I’m running a little late. I’m glad it goes for a whole month. LOL! Used 2 types of paper for the fronts. The mirrored gold paper, unfortunately shows everything. But I still liked it. 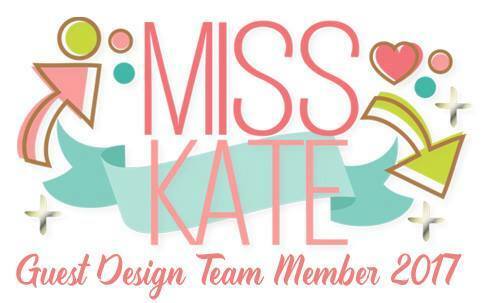 Using Cricut Design space, I uploaded Marjorie Ann Designs \ Kristi w. Designs – Gone Bananas. 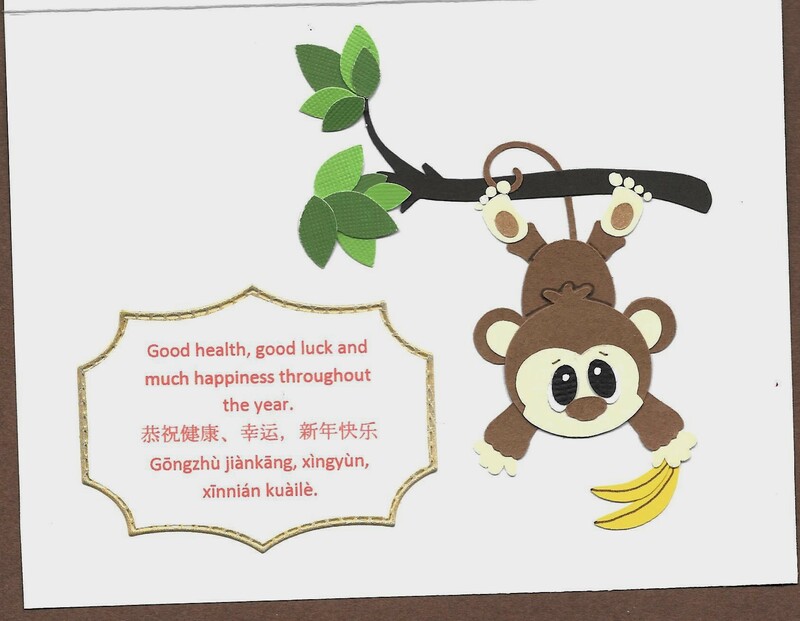 All of the monkeys are from this pattern. I created the type with Cricut Font – 3 Birds – Life’s a Party Cartridge. 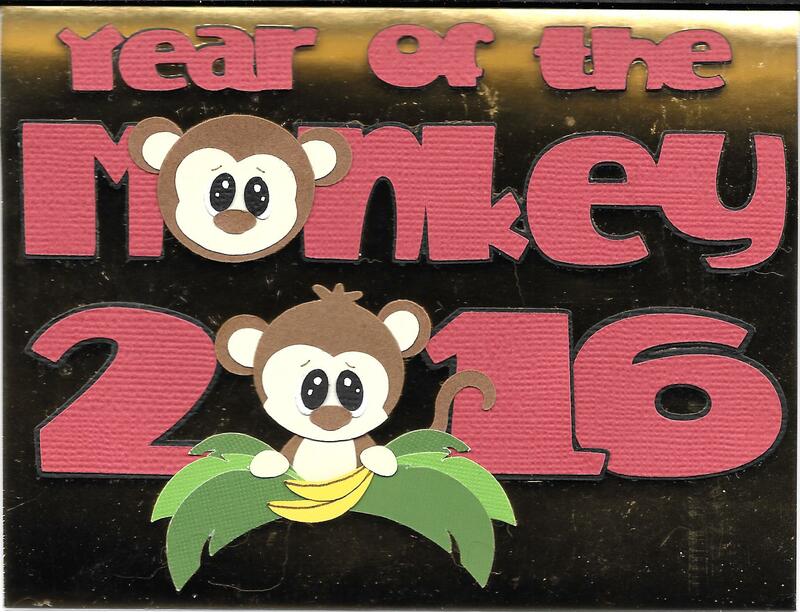 I thought the little monkey face would go great in place of the “o” and the other little monkey replacing the “0” in 2016. For the eyes, I used Gelly Roll Sakura #8 Pen. For the inside, I brought the wording into Microsoft Word and then pasted it 10 times on the paper before printing it out. 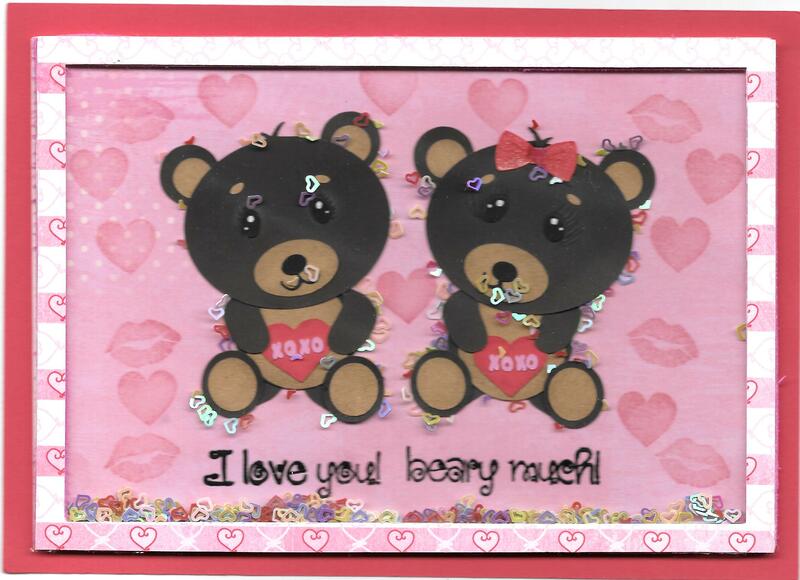 Then I used the cutting die from My Creative Time – Stitched Rectangular Frame Dies and More to frame the sentiment. Lastly, I went around each frame with Sharpie – Medium Point Gold Water based paint. I make 8 cards in total. There were a lot of little pieces and it took a long time, but I’m very happy on how they turned out. 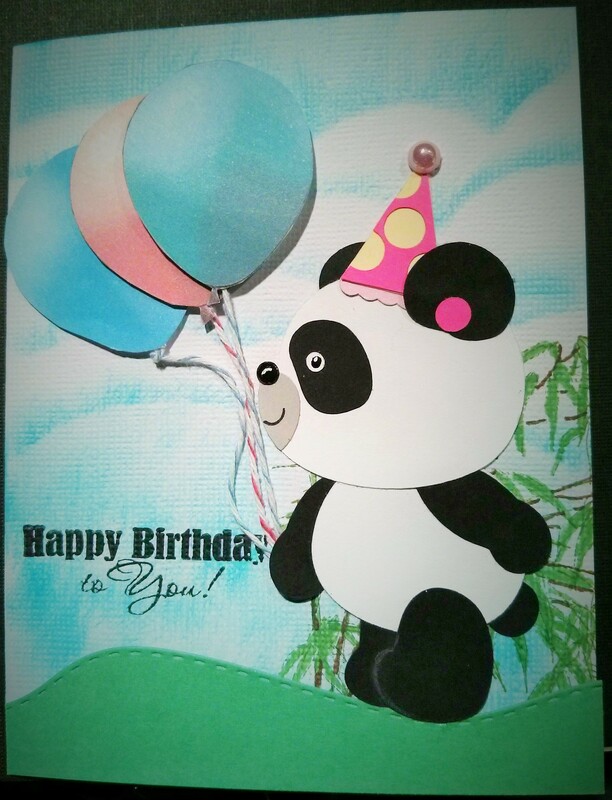 Back to share a card that I made for a dear friend of mine that loves Pandas. 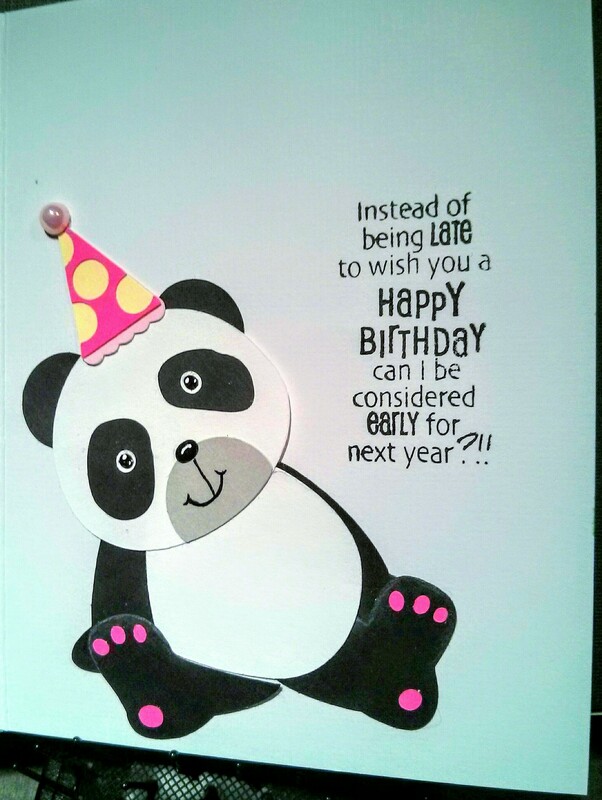 The pandas are from “Too Cute By Jessica – Cuddly Pandas”. As soon as I saw them, I knew I had to use them for her card. 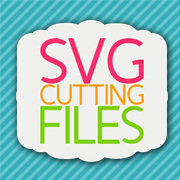 I uploaded the svg’s to Cricut Design Space and cut the images with my Cricut Explore. Added some white chalk around the edges where it was black on black. For the white’s on the pupils, I used Gelly Roll Sakura #8 Pen. 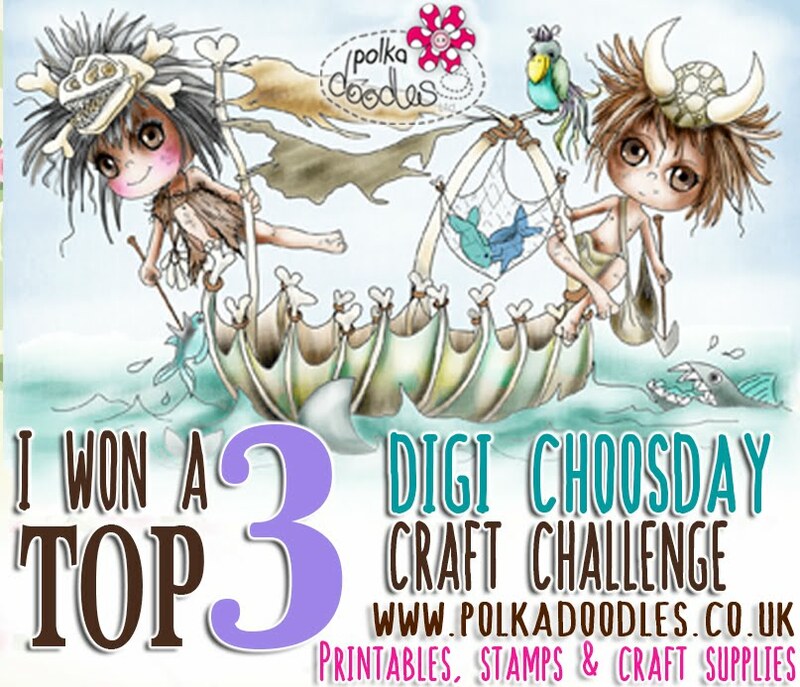 I made the sky on the front with Craftin Desert Diva’s – Stitched Scallop Dies and using Stampin Up Baja Breeze and Pacific Point mini ink pads on watercolour paper. 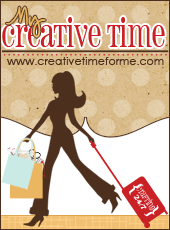 The ground is made using Craftin Desert Diva’s – Outdoor Landscape Dies. I think this is one of my all time favourite dies. 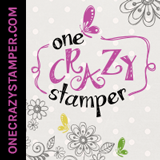 Bamboo stamp in background is from All Night Media. The balloons are cut from birthday paper filled with balloons. 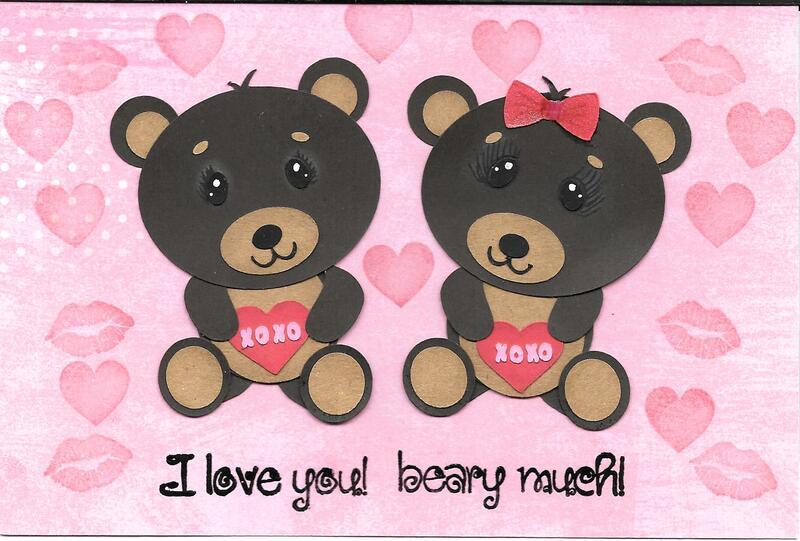 I cut 3 out and layered them. Then I added a little bit of twine. The hat is from Cricut – Sweet Treats Cartridge.